Dental implants are small titanium metal posts that hold artificial teeth in place, similarly to how roots anchor natural teeth in place. Most of a dental implant sits below the gum line, with only the tip reaching slightly above the gum line. Implants can be capped with dental crowns when replacing individual teeth or they can be topped with dental bridges or implant-supported overdentures when replacing multiple teeth. At Eagle Creek Dentistry. Dr. JW Valentine is your Naples, FL, dentist for dental implants. Placement of dental implants below the gum line involves a minor surgical procedure, which the implants are inserted directly into the jawbone. Inserting dental implants into the jawbone gives them a strong foundation for anchoring artificial teeth. Candidates for dental implants need to have enough bone to support the implants. Dr. Valentine, your Naples, FL, dentist, can determine if you have adequate bone for supporting implants. Following surgical placement of the implants, the gums are given time to heal before placing artificial teeth on top of the dental implants. 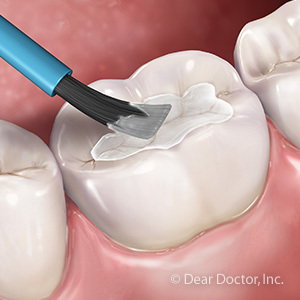 While the gums are healing, the implants begin fusing with the jawbone through a natural process, known as osseointegration. After a few months, the dental implants and jawbone will be completely fused together and dental crowns, bridgework, or an implant-supported overdenture can be attached to the implants. Dental implants can do many things for you. One of the most exciting things implants can accomplish is restoring your smile by filling in gaps left by missing teeth. They can also correct any sagging or drooping that might have occurred in the cheek and jaw areas by providing support for facial muscles. One function of teeth is to support these muscles. Sagging or drooping often occur when teeth are missing because there is not enough support for facial muscles. Another thing dental implants can do for you is improve speech. In addition to supporting the facial muscles and helping you bite and chew food, teeth also help you speak by guiding tongue placement when pronouncing words. Gaps between teeth can cause the tongue to slip out of place while speaking, which can change the way you normally pronounce words. Using implants to help fill in those gaps can improve your speech. One other way dental implants help is by reducing strain on the natural teeth. 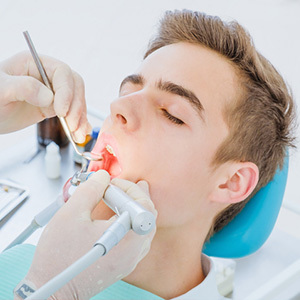 There is a tendency for remaining teeth to take on the work of missing teeth. Since there are fewer teeth to perform biting and chewing functions, the remaining teeth endure more strain than normal and can become worn down faster. By restoring your smile with dental implants, the work of biting and chewing can be distributed more evenly across a full set of teeth again. To learn if you are a candidate for dental implants, schedule an appointment with Dr. Valentine, your Naples, FL, dentist, by calling Eagle Creek Dentistry at (239) 417-6453.